House for 9 people with fireplace, barbecue and pool. Our house is located in Escalona del Prado, a simple place, with two beautiful churches and a wonderful Prado to walk. Its sunsets are of a special light. We are close to many beautiful villages. It is a good area to choose our stay as an operations center for wonderful excursions. The house has 200 meters distributed on two floors. The staircase is wide. On the lower floor we have two double bedrooms, one of them with a bathroom. The kitchen and living room are also on this ground floor. In the upper floor we have a quadruple room, they are two rooms but they are joined, to leave the bottom that has a double bed, you have to go through the one that has two beds of 90. It is comfortable for dads with children or for a lot of confidence. On this floor there is also another single room and bathroom. Outside you have a large garden and the pool, which are exclusively for you. We welcome all those who appreciate silence and simplicity. Escalona is located one hour from Madrid and twenty minutes from Segovia. The Casa del Prado offers you a space to share moments of leisure with friends or family, in a rural environment. In summer, the garden ... romantic and carefully neglected. Breakfasts, barbecues, the sunset ... The summer evenings are of swimming pool and water games, with sunbeds in the sun. The nights of contemplating a wonderful sky full of stars as you have never seen before. The blanket winters with fireplace and board games. Later, you can take an excursion or a walk. Moments of doing what does not give you time in the big city or day to day. Read, listen to music, cook, eat together, play, laugh or educate .. A way to isolate yourself from the world without missing anything. It has always been a house full of good vibes, you will feel good in it. Here the energies are good, and if you do not bring them, they will become good news. Neither smoking inside the house or bringing animals is allowed. The movements of large furniture and runs hallways are unwelcome inside the house because our parquet complains of pain. We are near Segovia. 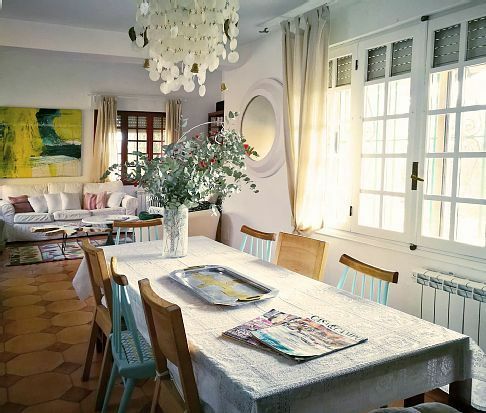 With 200m2 on two floors, the whole house can accommodate 9 people plus three extra beds. The house on the ground floor has a living room with fireplace and dining room ideal for cold days, eat at Christmas, family celebrations or a few days of blanket and relax by the fire. The Office is next to the kitchen, where there is also another large table to be able to meet and be together while you cook, or have breakfast. The rooms on this floor are spacious and comfortable, one with a 150cm bed and bathroom with bathtub, and the other with a 2x2m bed. There is another bathroom with shower. On the upper floor, we have a single bedroom with a 90cm bed, a common bathroom for this floor, and a quadruple room with independent doors, one with a double bed of 1.35 and another with two beds of 90cm . It is very appropriate for some potatoes with children. When it's good you have the garden, with a table on the terrace for barbecues or meals. The breakfasts are great in this area when you can enjoy it for the time. Nos alojamos el fin de semana un grupo de amigos, y no hemos podido estar mejor. La casa es preciosa, decorada al detalle y surtida con cualquier cosa que pudieras necesitar. Los espacios comunes son perfectos para un grupo de gente tan grande, y te hacen sentir como en casa. Tuvimos mucha suerte con el tiempo y hemos podido disfrutar a tope del jardín y la barbacoa. Le da el sol desde las 12 de la mañana, y también hay zonas de sombra para el que no quiera tanto sol. La calefacción funciona perfecta y no pasamos nada de frío. Ana y Fer nos ayudaron con cualquier duda que teníamos, y la comunicación con ellos fue rápida. En resumen, de 10. Esperamos volver pronto. Hemos estado en familia en fin de año, y ha sido una experiencia inolvidable. Ana y Fernando encantadores, la casa genial, muy espaciosa, limpia y super equipada. El pueblo con un encanto especial. Sin duda repetiremos. La casa esta genial, muy limpia, muy bien equipada, me encantó el jardín, bueno me encanto todo, estuvimos un grupo de amigos con dos niñas y estuvimos muy cómodos, Muy cerquita de la Hoces del Rio Duraton, del Castillo de Turegano y de Sepulveda. La recomiendo. Ana la dueña de la casa pendiente de todo. La verdad es que hemos pasado unos días geniales con la familia. Eramos tres parejas con dos niños y hemos disfrutado la casa y la piscina a tope, estaba todo muy bien cuidado y limpio.No nos ha decepcionado para nada. El trato con los propietarios ha sido estupendo. No dudéis en disfrutar de ella si podéis. La verdad es que nos hemos pasado unos días geniales con la familia. No nos ha decepcionado para nada. El trato con los propietarios ha sido súper cordial desde el momento cero y ha cumplido con nuestras expectativas. Si buscas tranquilidad y comodidad esta sería una gran opción. La casa está muy bien, tiene todo lo necesario para sentirte como en tu casa (o mejor en algunos casos) y los accesos son buenos y cómodos. Nosotros hemos estado tres días y la verdad que un par más no hubieran sobrado :) .. Recomendable. Hemos estado un grupo de amigas de reencuentro en la casa este finde largo. El buen tiempo ha acompañado para disfrutar del jardin con los.niños y ha sido una gozada. La casa es muy cómoda y el salón muy amplio y muy bien equipado. Los propietarios un encanto,nos lo explicaron todo fenomenal,daba ganas de pedir que se quedasen a pasar el.finde con nosotras! ;). No me importaria volver con la familia en verano para desconectar.